Opening times Mon 9pm–2am; Tue, Fri & Sat 10pm–4am; closed Wed, Thu & Sun. With its reputation for being Bristol’s friendliest nightclub, we are proud to offer clean modern surroundings, pristine sound quality and a warm welcome from our staff. 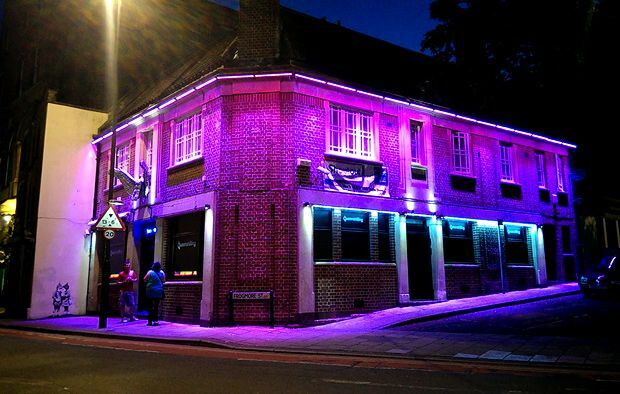 Located in Frogmore Street just a short walk away from Park Street, The Hippodrome and The Colston Hall, Queenshilling is easy to spot at night as the building is colour washed in LED lighting. Once inside you find a smart, upmarket and stylish bar area, well lit with atmospheric lighting. Take the weight off your feet in one of our comfortable seating booths or perhaps take advantage of the state of the art dance floor which is over looked by our DJs. Constantly evolving the Queenshilling is kept up to date and regularly maintained and refurbished to the highest standard, with more makeovers than Madonna. Everyone is welcome here regardless of sexuality race or gender. This venue is inviting, friendly and attitude-free.